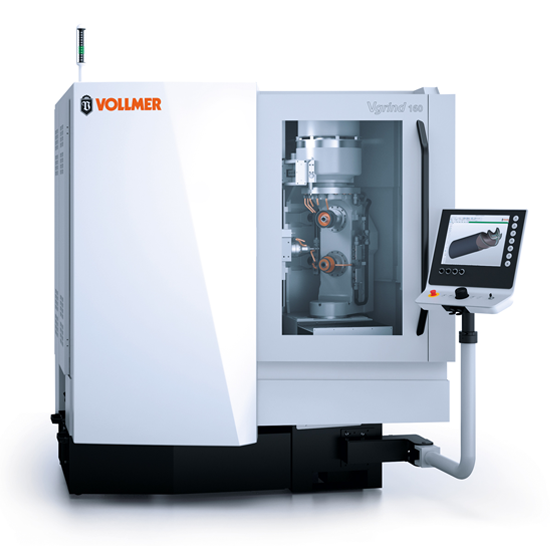 Vgrind 160 is the new grinding machine by Vollmer, Swabian specialist in the production of sharpening and EDM machines, with which it is possible for the first time the multi-layer machining, thanks to two spindles arranged vertically. This enables the fast and precise production of big quantities of solid carbide cutters and drills. 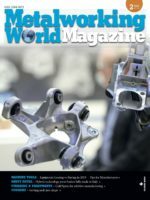 The new Vgrind 160 is a 5-axis grinding machine that couples the most innovative technology with a consolidated control technique. Besides, the original multi-layer machining system grants utmost efficiency, thanks to two grinding spindles positioned vertically and equipped with a set of abrasive wheels each, precisely on the rotation point of the C axis. Thanks to short linear distances among the axes and reduced rotation angles, Vgrind160 reduces tool production times. Idle times are shortened, too, because tool producers can equip the two spindles with various tools. The optional loader provided with 6 wheel packs allows changing the mounted tools automatically. The piece magazine, with maximum capacity of 550 pockets, grants an optimal machine use, 24 hours a day. Vgrind 160 allows attaining higher precision thanks to the precision of the multi-layer machining, since a workpiece is always machined by the set of wheels fixed stably. In addition, the wheel set is installed on the central point of the C axis, which permits an accurate grinding process. Further assurance of precision and repeatability is constituted by the design of the machine, constructed on polymeric concrete base, whose characteristics grant an excellent vibration absorption. The machine design and the state-of-the-art structure assure a sturdy and compact execution. Operations on Vgrind 160 are highly simplified and can be adapted to one’s own needs, thanks to the user-friendly central control panel. The display can be positioned in such a way as to grant an optimal vision to the operator. Vollmer uses the software NUMROTOplus to control Vgrind 160. This package provides several applications for the production and Service of various tool types. The software by the Swiss market leader, NUM, already finds applications in about 40 types of machines, offered by 15 renowned manufacturers, in over 50 Countries.